When one comes to think of it, Dhaka is a restricting city. One often feels confined to jams, long queues to banks, gas stations, ticket counters at bus stops, the list is endless. But had you to put yourself in the shoes of a disabled – reclined to a wheel chair, blind or paralyzed, then the scene can only become grimmer, and grim it really is. Theatres and malls are inaccessible to disabled people, train stations are just to be avoided for travel; so what is a disabled person to do but sit and sulk? However, according to Salma Mahbub, General Secretary of B-SCAN (Bangladeshi Systems Change Advocacy Network), “Disability is rather difficult to define. It is no longer a term used to define a specific medical condition; rather, 'disability' encompasses an ever growing range of conditions”. Whatever the definition of 'disabled', the fact is that there are at least 7,000,000 disabled people in the country comprising of about 5.6 percent of the population. Hence a favorable environment for the overall improvement of life of all People with Disability (PwD) in Bangladesh is the responsibility of not only the State/Government but every citizen of the nation. Hence, the question remains, what is being done for their betterment and hence mobility of the disabled?' After all, it is obvious that in order to progress, they need support and accessibility to services and resources like every other individual. This is especially true in case of buildings and infrastructure. 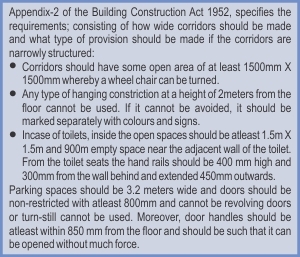 The Building Construction Act, 1952 (Act No.II of 1953) Section-18, specifics quite a few facilities for the disabled. * All buildings should have everyone accessible system from parking space to lift lobby. * Any public building (hotel, educational institutes, hospitals, meeting place, trading houses) over 100 meter square should be accessible to all. * Each floor of a building should have atleast one toilet or 5 percent of the total toilet (which is ever higher) as disable friendly, having proper signs/directions. * Each of these regulations should meet the minimum requirements of Appendix-2. The Building Construction Act, 1952 was revised, published and distributed in 2008 however this is an amendment that has long been there. But there are very few cases in which all the necessary infrastructural provisions for the disabled are made. Most post offices in Dhaka do not even have ramps for wheel-chair users. Main branches of big banks such as Standard Chartered in Gulshan do not have accessible wide doors for the movements of the disabled. “If public buildings are not accessible by the disabled how are we to expect other places like malls and private offices expected to provide such facilities?” says Kamran, a student, who, also stricken by polio, cannot walk. 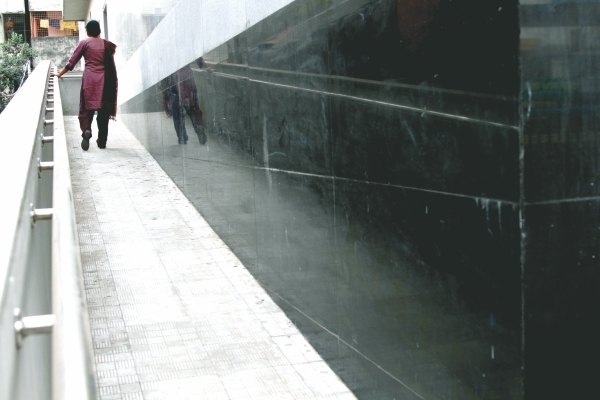 “Educational institutions like Dhaka University's Arts building do not have provisions for the smooth movement of the disabled,” he adds. This also includes buildings like the Jatio Nattmancho at Shegunb-agicha, Press Club, Reporters Unity and many other places. Nowadays, there is a growing trend of lands being sold off to developers for construction of buildings; they hardly adhere to these codes for buildings. The reason they provide is that they specifically cater to the demands of their clients; hence, they often do not bother because their clients do not need these provisions. “But these provisions are basic rights, and you cannot measure right by quantity of who want it,” says Salma Mahbub, “besides it is part of a Government law and the law must be abided by everyone”. 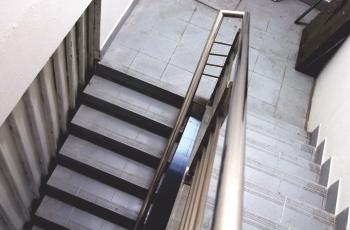 What one needs to appreciate is that when we do not make a place accessible then we are constricting mobility and thus contributing to making those who cannot access the place to become disabled. So in essence we leave spaces for the definition of the disabled to be undefined and that is a folly needed to be set right. After all, the disabled are part of our own communities and they can with some assistance help us as resources not as burdens to society.